Comments on "on The Street.......Not Half Plaid, Manhattan"
Call me a fashion dummy. This outfit just does not look right. The half-tuck, half-untucked look for a shirt of a certain length looks fine, but is far too studiously disheveled for my taste. how is a blue blazer and shorts way overdone?? he. is. sexier. in person! Way UNDERDONE, as far as I can see. This guy looks as if he just fell out of bed and put on whatever was at hand. There's nuthin' happening for me here. Great photo, Sart! This is a case where the different elements are much more successful than the outfit as a whole. The blazer, the plaid shorts, the black oxfords, the narrow tie, the hornrims -- these are some great pieces. I wouldn't necessarily wear all of them together at the same time, as this young man has done, but to each his own. I know a lot of people are going to say that it looks like he forgot his pants this morning- but I think he looks like a wacky-inventor type, like the dad from Honey I Shrunk the Kids, but younger. For some reason... I think it looks good. You should have shot this against a phone booth--he looks very much like he was caught changing into super scotsman--from Clark MacKent. Very hot, I would prefer it if his shirt was all tucked or all not tucked. Refreshing to see plaid shorts looking so good. 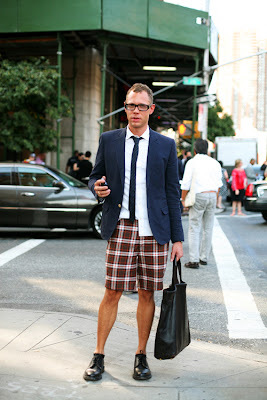 The dressy shoes with shorts look a bit off to me - and the plaid shorts merely look like boxers. Too studiously casual to be effective. such confident comfortable attitude! i adore the shoes, the tie, everything. now if he'd just tuck it in. . . I like this outfit..I do, but at the same time it looks like he just forgot to put on some pants & walked out in his boxers. You can tell that he had fun dressing for the day, and going out to the city to see people's reaction to his greatness! On first glance, I thought this look was pretty cute. Second glance...well, he looks like he forgot to put his pants and socks on before he left home, and is wearing plaid boxer shorts. Third glance, how about some short fiction: Her husband came home unexpectedly and he had to leave very quickly via the fire escape! Too affected and those shorts look like boxers. It's half plaid and half bad. Get some fashionable shorts, man! And put away those American Eagle frat-boy shorts. love the ysl essaouira tote. the rest of the oufit - so, so. Wow that man looks FABULOUS! Is this the brother of shrunken suit guy? I had to A/B them to make sure it wasn't the same guy but this whole 'I'm breaking the rules, so what?' thing is in a similar theme. His look is right out of GQ. The skinny tie, plaid pants, nerdy glasses thing. I don't really dig it when it's just a rip off. REAL nerdy guys=way way hotter...and more intriguing too. I just sent an imaginary Dear John letter to Hot Polo Star Lover telling him I am dumping him for this guy. "hey, that's a really nice tie. Can I take your picture?" Two words: No likey. I agree with Mcgee, this look is too consciously rumpled to be authentic. The guy has great legs though, but if I saw him on the street I'd think, "pul-leez, Louise." And the half-tuck thing is just horrible in general. I can almost accept it with a T-shirt and a great belt buckle but even that is kind of pretentious. Hope you didn't spend too many minutes on these last few. ;o) Still it's all quite cute. But luuuv the blog and the guy here is cool. Especially the top half. this is great. he must have had a wild week before getting up that morning, asking himself what he should wear and put that together. it looks like the culmination of several steps toward fashion anarchy. not for the novice. don't care for the half tuck and, yeah, the shorts look like boxers, which is too back, because everything else is excellent. you might be less likely to notice him a normal pair of pants, but he really would look better. If we saw him on the street we wouldn't think he's that cool, but when you think about it, this is style isn't it? I love that he carries his bag on the same side as the untucked part of his shirt. It produces a nice stairway effect. I'm not sure abou that. But I think it would look better if he weard Chucks instead of this dressy shoes. Is he a poster-boy for Band of Outsiders? i believe the tie and the jacket are of that brand. I love everything but the demi-tuck. it looks too calculated and over-wrought. With a full tuck the look would be awesome. I dig the whole dress shoes and shorts thing. It's grown up yet playful. i think he is sleepwalking..
i don't think anyone would seriously wear this in the daylight..
it's too much of things going on..
Naw, this is kool. Overly studied, perhaps, but still amusing in an original way. Shorts are a kind of kilt evocation, and the untucked shirt tail is just the right touch. For me he pulls it of because he's tucked in his shirt nicely and matched with the right tie, but it's kind of a strange look, yes. Just wanted to say that i loved your shoot for UK Elle "Style in the City", you got a very natural look even though the models were sporting dior bags and prada shoes. Great job! again, he looks like he's a member of that group of guys you photograph who keep forgetting to put their pants on before leaving the house...especially w/ the untucked shirt. i enjoy this. imagining the looks i'd get if i rocked this look around town...i think YES. Nice job... wish I had was tan enough to pull this off! you don't see anything else in the image? what about the idea of shorts with heavy black dress shoes. I think that is what really caught my eye about this. I like it. He wears it well. Is the shirt deliberately untucked? Have to respect all the effort for this ensemble. And I think it works on him. Amateurish? Yes, I think most of the commenters on your blog are not fashion professionals. Isn't that part of the point? It's not just about the shorts with dress shoes look, it's that they're a plaid that is very reminiscent of boxer shorts. They just are. the key to wearing plaid to make it not look like pajamas. i applaud his effort, but it's not quite there. i think he looks a bit like "David Letterman when at prep school." still, all in all a cool look. a few commenters seem to forget that some of your subjects are making a style statement/experiment, while other are simply stylishly appropriate. i think this fellow makes an interesting statement. Obviously this isn't the "he just rolled out of bed" look. You can tell that he took time to look like this otherwise he wouldn't be carrying that hefty leather bag along with the woody allen glasses and artsy look of it all. He knows what he's doing, he's stepping out of the norm and I commend him. Also he has great man legs, why not show them off. He looks too old to dress that way. Rather undignified, if you ask me. my thought is that why wear a jacket if it's hot enough to wear shorts? and why heavy-looking leather oxfords with one's legs exposed? ...i call it common sense. yes!! too studiously disheveled! that's exactly the sentiment i was searching for, mcgee. brilliant. the shirt completely turned me off to the other elements that i would have been open to. it's a bit costumy, sort of "naughty schoolboy" (oh someone else said that, too), and the shirt sent it over the edge. and i did not get boxers from this. more like kilt, which is kind of whimsically interesting, athough i'm sooo glad it's not actually one. blue and black working together well. and i like the hunter green behind him.. kinda completes the color scheme. but definitely, Team Tuck! i'm resistant to be too supportive because of the affectation oozing from that irksome shirt. suspect: in some areas (Manhattan, the upscale bit of Stockholm) people are now running around with nothing to do, their only hope to be captured by the Sartorialist in one of his increasingly commercially oriented forays. Plaid in full! the guy looks excellent btw: arty-Sarty is what I'd call his style. its chic. it's now. its expensive. i love it. if thats a YSL bag too then he's up and coming. perhaps the shirt just came untucked?? re all the "studiously disheveled" comments - this pic was taken on 10th ave, after the thom browne show at NY fashion week. (i saw the subject sitting in the front row) if memory serves it was over 90 degrees that day. trudging thru nyc in that kind of heat may naturally produce some sort of dishevelment? i say well done; at the least we have all taken the time out of our lives to comment about it and so if only for that i applaud. Love the shoes, glasses and bag. HATE the half-tuck. The headline is perfection! I think that's Peter (don't know his last name)-David Rubenstein & Jeffrey Kalinsky's assistant. He's always well-dressed. wouldn't this have worked better with a pair of beat-up, low cut off white chuck taylors and a more classic canvas tote with navy blue handles? maybe a gin and tonic and a sailboat? This dude is trying too hard. I hate when an outfit just doesn't make sense, because if it's hot enough to wear shorts, then why would you wear a jacket. It's one thing to wear a long-sleeved T-shirt with shorts at night down the shore, but it's too unbalanced. i sooo love this one! he's.. wow! and the clothes... couldn't have been better. Great shot.... and you really just met this guy on the street? the half untucked shirt is a little much, but other than that it I like it. A lot. love the refined casual look.